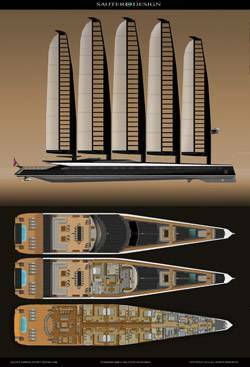 Emax E-Volution: The Fastest and Greenest Superyacht Ever? Designed by Sauter Carbon Offset and built by Ned Ship, the 66m Emax E-Volution is, according to the designer, a culmination of the best the yachting world, a vessel with a maximum speed of 28 knots and an unlimited "Zero Carbon" cruising range at 14 knots. Highlights of the design include. - 2MWs of ZF Hybrid Power supplied by MTU 2000 series Tier 4i engines, the cleanest marine diesel engines on the market. - An additional 3MWs of energy harnessed from sustainable sources is stored and employed as ballast in a lithium ion UPS. provide the advantage of full time Global Positioning, an alternative to environmental damage caused by anchoring. 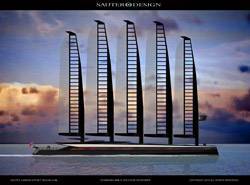 services or by returning energy to the grid offsets up to 4,500 Carbon Nautical miles Cruising at 22 knots. weather conditions the mainsails are reefed and the stay-less rotating Wingmasts are feathered into the wind. The Captain’s Cabin is a double with en-suite bathroom, it is located at the bow of the Main Deck as well as the Crew Cabins which are 6 twins with en-suite bathrooms along with The Fully Equipped Restaurant Galley and Crews Mess. This 100sqm Rear Sun Deck and Pool Area has an 5m pool an gives incredible flexibility for a number of uses such as Sunbathing, Dancing, Parties, Entertaining and Events. This comfortable and versatile 70 sqm area offers magnificent 360 degree views. It is ideal for relaxing on the sofas and enjoying the breeze, or alternatively for hosting a formal Gala event seating up to seat 36 dinner guests. This deck is protected from the sun and rain by an extendable Photovoltaic Canopy. It serves as an open-air outdoor Cinema with a retractable Giant Flat-screen that can be viewed by over 20 Guests. Here is located a Jacuzzi Plunge Pool as well as an enormous daybed sofa arrangement surrounding a drinks table and a separate Sunbed and Sofa Area further forward at the bow. A beach club with storage for toys extends out the stern and next to it 2 x 8 meter tenders are stored in garages in the sides of the hull. The Lower Deck along with the Engine Room and additional storage with walk-in refrigerators for the Galley can also house a gym, steam and sauna room and Surround Sound Cinema.